AATC attended the Southeast Design-2-Part Show, 2016. AATC will be attending the upcoming EuroSatory 2016 and the Farnborough Airshow 2016. Hope to see you there! Bell Helicopter (a division of Textron) performs Level 3 assessment; the audit is a success & we hope to work with Bell very soon! AATC Will be attending the Farnborough International Airshow 2014. The Venue takes place in Farnborough Great Britain with over 1500 companies. Two new 300 lb capacity Striko-Dynrad aluminum holding and melting furnaces installed. Each dedicated to a particular alloy of Aluminum A356 and A357. 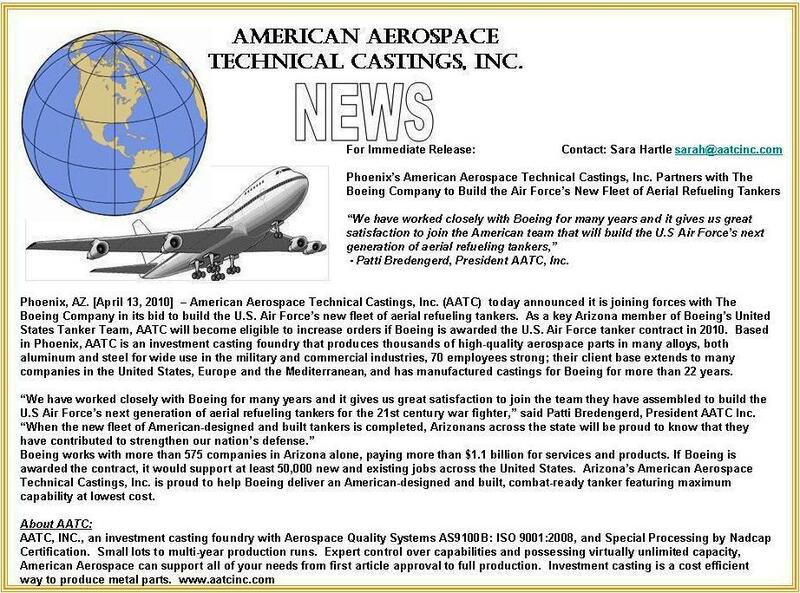 American Aerospace T.C., procures aluminum heat treating furnace which will be installed in our own facility, to again further our capabilities and capacity expansion planning. 6000 sq ft addition to AATC's Phoenix, AZ facility is completed and our machining operations have been successfully relocated to this facility. In addition, the expansion of our machining operations includes a new 5 Axis CNC and a 4 Axis CNC to our capability list. AATC achieves PRI/Nadcap certification for material testing. American Aerospace T.C., partners with Boeing and Goodrich Aerostructures in two highly motivating LEAN / Kaizen events in its Phoenix facility. AATC partners with The Boeing Company to build the Air force’s new fleet of Aerial Refueling Tankers. As a key Arizona member of Boeing’s United States Tanker Team, AATC will become eligible to increase orders if Boeing is awarded the U.S. Air Force tanker contract in 2010. Read News Release here. 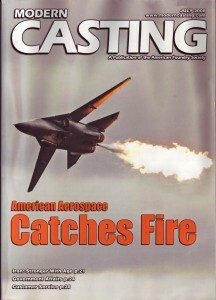 June 2009 AATC procures Spacecraft Manufacturing, Inc.
AATC procures Spacecraft Manufacturing, Inc. A Glendale, AZ based machine shop. 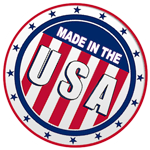 American Aerospace will work towards expanding this operation and providing full machine shop services to its existing customers. AATC hosts a luncheon for the World Foundry Organization. The World Foundry Organization (WFO) represents the collective needs and beliefs of the principal representatives of foundry associations of member countries on a global scale. The WFO is a neutral body representing the interest of the Cast Metals industries in a broad range of countries.